The Buyer: Mr. Andre Smith has recently left a large telecommunications company and a leadership role that spanned the product lifecycle from ideation to post-sales support, in functional areas including product development, business development, consumer marketing, customer experience, merger integration, strategic alliances, field sales operations and customer care. Mr. Smith’s objective was to fuel his passion for leadership and business-building and was seeking a company positioned for top-line and bottom-line growth. His extensive financial and operational knowledge and experience in operating organizations will be essential in building a foundation for continued and future growth. 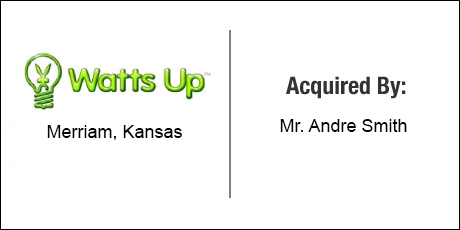 The Seller: Watts Up™ has been in business in the Kansas City Metro area for over 23 years and serves as the areas number one source for any kind of bulb or lighting need. The company also sells ballast, H.I.D, decorative fixtures, replacement glass, projection bulbs and stage lighting. The Close: The owners of Watts Up™ had reached the end of their 10 year plan of ownership and were ready to sell. After receiving a letter from DVS, they were introduced to Andre as a candidate with the energy and skills to manage the company for many years to come. Given the opportunity to grow the company rapidly through MBE status under Andre’s ownership, ensuring adequate working capital in the company early on was a point of great focus. DVS engineered a deal structure that gave Andre ample capital reserves for growth while also providing a clear path for the sellers to be repaid on an accelerated basis.